Having used Sudocrem nappy rash cream since Thomas was a baby I was keen to try their new products, Moisturising Mousse and Sunscreen Mousse. Both me and my 2 boys have severely sensitive skin which means we can not use many skincare products. When I read about Sudocrems new ProDrem formula I was fascinated to how our skin would react to this new product. Apparently it mimics the skins composition to moisturise and protect the outer layer making it faster absorbing and leaving the skin to breathe. I was hoping this would be the answer to our dry skin nightmare. Trying this out for the first time I was amazed at how little I needed to use. Just a little squirt of mousse would expand enough to do the whole of Thomas. He loved having it applied as he sad it was fun looking and even joined in rubbing it in which is great for me as he's usually too impatient and wants to be running off out. I found it quick to rub in and non greasy, with an SPF of 50+ it's a must. Running around the park, playing on the swings and sat eating in the park, the mousse kept Thomas protected from the sun. Both the boys and I suffer from dry skin and we also have severely sensitive skin which becomes a big problem when trying to keep our skin moisturised. I always try new products on the boys to see which are better and of course which are worse and was hoping this would be another thumbs up product. Trying for the first time I apprehensive whether they would come out in a rash or blotches but luckily this was not the case. Just a small amount of foam rubbed onto Thomas's arm almost instantly made his skin look hydrated which I was surprised about. After a few days of using it I realised that both boys skin looked healthier and a lot softer and the red patches had almost gone. As I suffer from dry skin, I have also started to use the Moisturising Mousse as well. I have dry skin mainly on my knees but also it flares up on my arms too. After using the mousse it seems that already the dryness seems to be clearing up and hopefully in time it will totally go and I will have nice and smooth skin again. 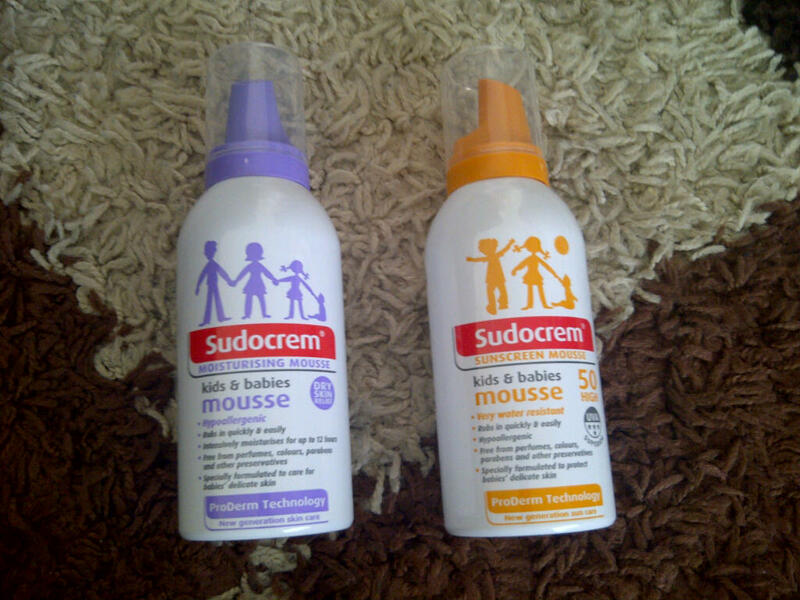 Sudocrem Mousse can be bought in store or online from Boots. 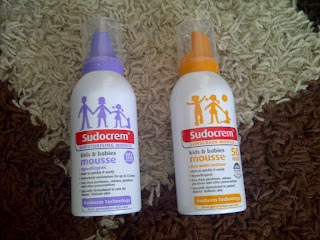 Sunscreen Mousse RRP £15.00 and Moisturising Mousse RRP £8.99. 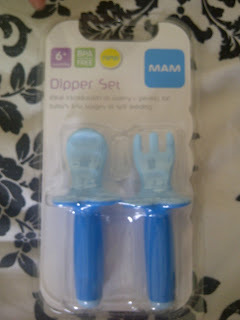 When we were asked to review the MAM Dipper Set I was excited. I must admit that we are a bit addicted to MAM. From bottles, soothers, training cups, teethers, and bowls we have everything. Trying one of MAM's new products especially one that helps with feeding is great for us as Charlie loves his food. Before using these I would have to feed Charlie myself as he could not hold a regular spoon without food falling off it so having this would make Charlie more independent. Starting out I found that Charlie enjoyed holding them, the handles are only small, just big enough for him and having bumpy bits on the spoon meant it holds more food in the creases. The fork also has the same bumpy bits but also gives him the option to pick up bigger food bits and lumps. 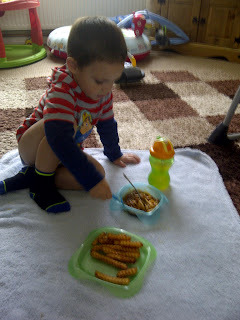 He enjoyed feeding himself independently and learning to pick up the food himself. One of the best parts of the Dipper set is the fact that they have a lip to stop them from being pushed too far into the mouth, I love this part of it because when I normally give Charlie regular children's cutlery that's the first thing he does. I will definitely be using these from now on as it made feeding time a lot easier and means Charlie has learnt and can feed himself which is always a plus. These are the gorgeous Mocc Ons. They are made by the people over at Socks On and are just beautiful. When we opened them I couldn't wait to put them on Charlie to see how they looked and they were fab. The fitting of the material means they will stay on his feet even when he's pulling at them which is great in cold weather because usually he ends up with no socks on and cold feet. They come in 4 different styles, funky cow print (the ones we have), pink spot, zebra stripe and rainbow. You can also get them in 3 sizes, 6-12 month, 12-18 month and 18-24 month. Charlie is in the 6-12 month and although they fit him when he was 7 month old, they still fit him perfectly now at 9 month old. They have a leather sole and even though its soft and comfy for Charlie to wear, they are also such a big help when it comes to him standing up because they make him stand flat on his feet as opposed to on his tip toes which is how he usually stands. One of the things I like is that they have been made so they are strong enough for him to walk on but also he can wear them throughout the day without them getting uncomfortable. I guess to him they just feel like socks. I love them because they are so stylish yet practical, they are washable and even quite affordable. I would definitely recommend these especially for babies who are just getting up and about and learning to walk as I've found these a great help for Charlie. When I had Thomas we went through a lot of prams, different brands, different styles until we came across the Hauck brand. Back then we decided on the Hauck Jeep Infinity which as well as been big, sturdy and bold was also comfy for Thomas and easy for me to push. So this time round it was a no brainer, go for a Hauck again. After much deliberation of which to choose from we decided on the Hauck I'coo Pacific. I liked this pram as it had bold colours and looked different from your average pushchair. There was an extra surprise when I found out that it changes from a pram to a pushchair with just a couple of clicky straps. The seat pad flipped over to reveal a white cushioned base for Charlie to lay in whilst newborn and the boot cover clips over to make it into a pram. There are a lot of reasons why I picked this pram but the one most important was the fact that it can be rearward or forward facing. I like the fact that I can just look down and see Charlie without having to lean over or pop my head round the front of the pram. Also to sit up and recline the seat is just one button and very simple to do. This pram has many tricks up its sleeve though and the one I most admire is the fact that the seat unit can be highered and lowered to suit. So for example if we are in a cafe I can higher the seat unit and push Charlie under the table better as though its a kind of highchair which does save a lot of space and time. Now for the features and extras. Not only do you get a fully adjustable canopy but you also get a matching boot cover and changing bag, there really is nothing more you need to use this pram, its up and ready to go. It is suitable from birth, has a detachable bumper bar and a large shopping basket which is always great for carrying those little extras we always need when out and about. The hood is very large and when used as a pushchair can be zipped up to make a smaller hood. I also find this great is sunny weather as I unzip the hood and open it fully out stopping sun from shining on Charlie's face. I find that the I'coo Pacific is very easy to manoeuvre one handed which is always a must when also having to hold Thomas's hand. Its huge back wheels means it can go across any terrain easily and its front swivel wheels make the pram go round corners with ease. I would say the only flaw in this pram is that it doesn't fold down very small but I guess if you want a pram that is big, safe and truly gorgeous then it's an ok sacrifice to make. The Hauck I'coo Pacific comes in Coffee (the colour ours is), stone, timber and tomato red. 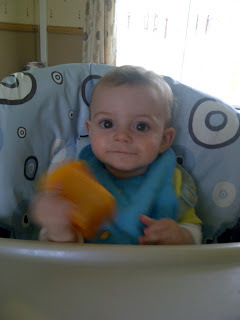 This set of baby weaning products is probably one of my favourites of all time. The full collection, everything you will ever need to get to feed your child until they move onto proper crockery. The colours are a mixture of unisex colours so can be used for a boy or a girl. 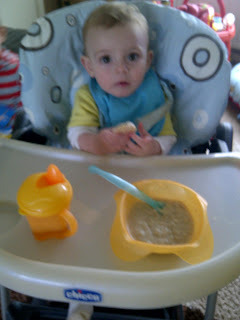 In this set is 3 bowls, 3 plates, 3 food pots, 1 200ml cup and 6 spoons and all for an amazing £9.56 from Vital Baby. With such a cheap price I was expecting them to look cheap and flimsy but not at all. They have pretty designs, innovative 'wings' on the bowls to help stop spillages and even the beaker has a flip up spout which means it will not leak when out and about. Starting with Charlie, first of all I loved the wings on the bowl because every now and then he would grab it and these stopped it from easily tipping over. Also I found that these made it easier to hold the bowl sturdier. The spoons are small enough to fit into his small mouth yet still hold a fair bit of food. 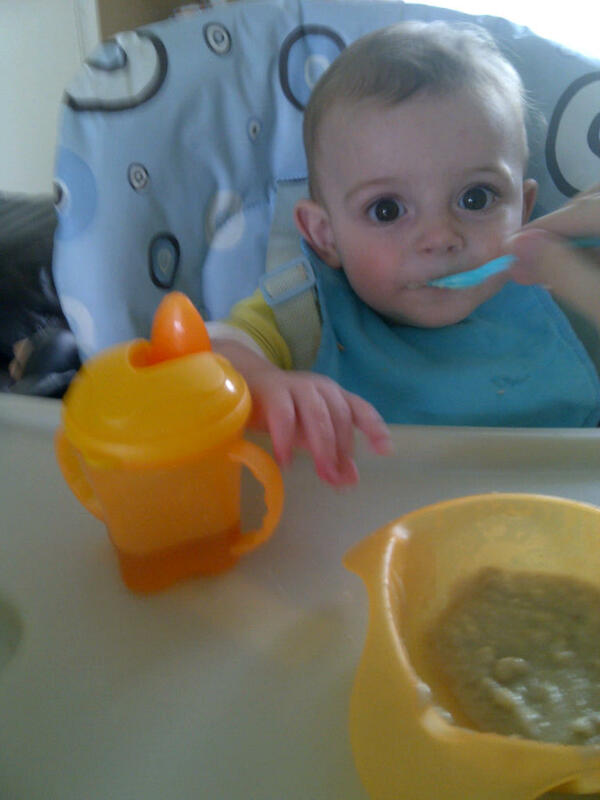 Charlie loved using the beaker so he could actually be independent and drink on his own. The best part was that even though he was flicking it back and forth it did not leak a drop which is always a bonus when you have cream carpets! The set comes with 3 plates which is great for us as Thomas uses these, they fit his dinner on perfectly or if we are having something in a bowl then they easily hold his accompaniment, on this occasion, his chips. The 2 feeding pots always come in handy when making up portions of food for Charlie. They are the perfect size, I can just fill them up, pop their lid on and straight into the freezer for when I need them. I would say overall, I loved the design and sizes of all the set and especially loved the price! I'm a big boy just like my brother! Now Charlie may be only 9 month old but he tries his hardest to copy things Thomas does. He follows him everywhere and grabs him at every chance possible. He is currently mastering crawling and today Charlie decided to become action man and throw himself into his Postman Pat inflatable ring. 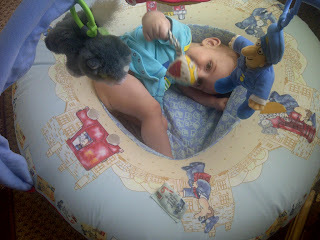 As you can see he found it difficult at first, after a while he got himself up and into it but then got stuck! Laid flat and stuck trying to get his toys! Woohoo!!! He got it! Only to throw it straight out of his play gym and then continue to chase it. Trying again for a while to get out eventually he got stuck in one position and then gave up! Charlie laid hung over the side of his play gym for about 5 minutes just wriggling his toy around. Now although this is great to see him moving about and playing more but it means my baby is growing up!! !